A few years ago, when Mehdi Alami?s son was injured playing hockey, he researched medical options and ended up taking his son to a cryotherapist on Long Island. His son recovered ? quickly. For those not in the know, Cryotherapy, sometimes known as cold therapy, is a pain treatment that uses freezing temperatures to reduce inflammation of the body?s muscles, deaden irritated nerves, slow down cellular metabolism, and improve circulation. 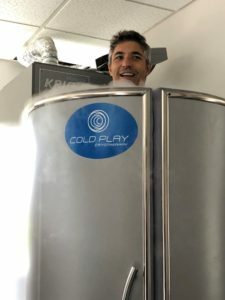 Alami was so taken by the treatment, which is medically prescribed for chronic pain in Europe, that he decided to open his own cryotherapy clinic, Cold Play Cryo in Greenwich two years ago. During a typical three-minute session, a client ? willingly and nakedly ? steps into a Cryosauna which is filled with nitrogen-cooled air that dramatically lower body temperature. Why do so many of Alami?s clients leave feeling invigorated? ?Because the treatment causes the body to release endorphins, which are feel-good hormones,? he replied in a recent interview. 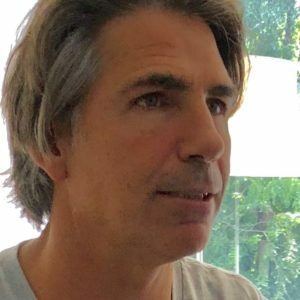 The benefits, according to Alami, a veteran of Westchester?s most competitive amateur tennis league, also include increased athletic performance, anti-aging, and cellulite reduction. He demonstrated the effectiveness of using a hand-held pump which blasted cold air on an aching elbow, which proved much more effective than an ice pack. 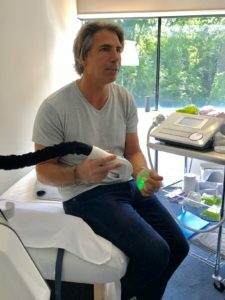 While many of his clients are weekend warriors, he has quickly built a client base of men and women for are looking for non-invasive beauty treatments. Among the services are CryoToning and CryoSlimming. ?The treatments destroy fat cells,? noted Alami. And when can you expect to reap the benefits? we asked hopefully. ?Immediately, and if maintained at regular intervals they will last. ?